Stocks are entering the fourth quarter of a midterm election year, a time when the market is usually higher with an average gain of more than 7 percent. Strategists say the S&P 500's third quarter gain of more than 7 percent doesn't mean it can't continue to climb into the end of the year. Stocks usually see slight gains in October, with an average S&P 500 gain of 1 percent, according to CFRA. 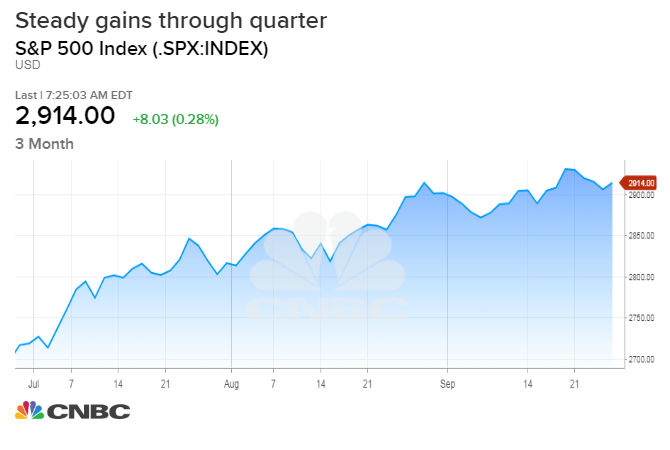 Stocks are entering what is typically one of the best times of the year for the market, after making a surprisingly strong showing in the often choppy third quarter. The S&P 500 is set to close out the third quarter with a solid gain of about 7 percent. As long as there's not a huge drop on Friday, it will eke out a small gain for September, usually the worst month for stocks. "Does that mean we're going to be stealing from the fourth quarter results, which are usually positive? The answer is slightly, meaning we're borrowing a little bit," said Sam Stovall, chief investment strategist at CFRA. Stovall said the average fourth-quarter gain for the S&P 500 since World War II has been 4.1 percent. "If Q3 is positive, then Q4 is up 3.8 percent on average, and the market rose 82 percent of the time." But this is a midterm election year, a time when the S&P saw has historically seen an average fourth quarter gain of 7.5 percent. 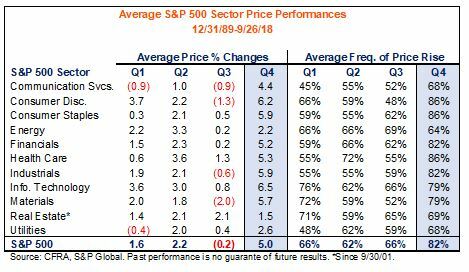 Stovall said when the market is higher in the third quarter of a midterm year, the gain is slightly smaller on average at 7.1 percent but the S&P is still up four out of five times. "A positive Q3 only shaves a small amount off the substantial fourth quarter. To me that's encouraging. ...That means this momentum train will reach its next stop," he said. Strategists had been looking for a pullback for months, and it seemed like the month of September could have been that time, since it historically is a poor time of year for stocks. But stocks made gains, as some of the developments around trade were not as bad as feared and the economy continued to look strong. The S&P 500 in now up about 0.4 percent for September. For the month of October, the S&P have been up 1 percent on average. "We're really focused on the fundamentals, and from a fundamental perspective, there's nothing specific to the fourth quarter we're really concerned about. We actually think for the time being, the outlook is pretty constructive. We're pretty bullish on equities still. We think the profit cycle in the U.S. is healthy," said Daniel Suzuki, portfolio strategist at Richard Bernstein Advisors. Bruce Kasman, global head of economic research at J.P. Morgan, said the market faces some risks in the fourth quarter, including a potential escalation of trade wars, stress in emerging markets and the risk of higher oil prices after U.S. sanctions on Iran take effect in November. Some analysts have pointed to the potential risks from the elections, should Democrats sweep not only the House but take back the Senate. Some stock strategists say the market would react poorly to a Democratic Senate, which is not expected, though some polls have tightened. But Kasman said he does not that as necessarily having an economic impact. "It seems who runs the Senate will matter more for oversight and perhaps a check on executive power more broadly, but I have a hard time seeing it have a big impact on the economy," he said. Stovall said the fourth quarter could be good for stocks, but after that he sees a shallower trajectory higher. "I think seasonally we do well heading into the end of the year, and historically the market is higher 12 months later," he said. "I don't think it will be a double-digit year next year because comparisons will be tougher, whether you look at the economy or whether you look at earnings. The trajectory is still higher but the angle of ascent needs to come down."